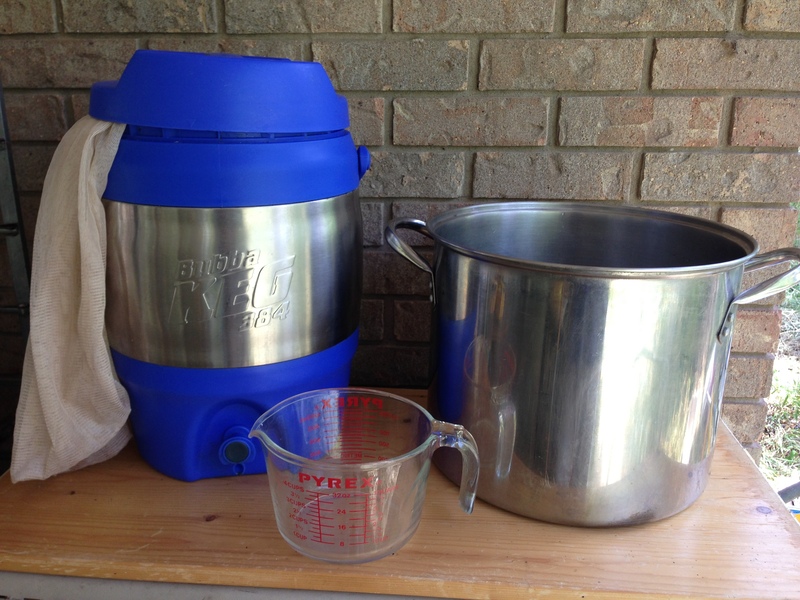 Here’s all you need to make 3 gallons (11 L) of all-grain wort — a 3-gallon (11-L) beverage cooler with a large steeping bag, a measuring cup and a 5-gallon (19-L) brewpot. It was 103 °F (39 °C) yesterday, but I went ahead and brewed anyway. Did I sweat my way through a brewday on my porch, with my brewing rig, making 10 gallons (38 L) of wort while swatting mosquitoes and fighting to stay hydrated? No, I brewed inside, in air-conditioned comfort, watching Shark Week during my breaks. I did it by making 3-gallons (11 L) of all-grain beer using a 3.0-gallon (11-L) beverage cooler as a lauter tun and my normal extract brewing stuff. Here’s what I did. Last week, I decided to brew my porter. However, I knew it was going to be hot out, and at first I thought I’d make a 5.0-gallon (19-L), partial mash batch in my kitchen. I had a 2.0-gallon (~8-L) beverage cooler that held 4.0 lbs. (1.8 kg) of grain and have made many 5-gallon (19-L) stovetop partial mash batches using it as a mash/lauter tun. Then, when looking around at what equipment I had — especially my 3-gallon beverage cooler (I like cold beverages, sue me) — I figured out an easy way to make an all-grain, 3-gallon (11-L) batch. Of course, at first the mathematical genius part of me pointed out that 3 gallons is less than 5 gallons . . . and beer is delicious. Plus, partial mash beers can be indistinguishable from all-grain beers. Why not just make 5 gallons (19 L)? Well, for one thing, I can do a full-wort boil with 3.5 gallons (13 L) of pre-boil wort on my stovetop, but I can’t boil 6 gallons (23 L) down to 5 gallons (19 L). Secondly, for a 3-gallon (11-L) batch of moderate strength (~5% ABV) beer, I don’t need to make a yeast starter — the roughly 100 billion cells in a package of Wyeast or White Labs is just about right for fermenting this beer. Thirdly, the wet T-shirt method of cooling works better for smaller batches and my chest freezer is on the fritz, so I’ll be able to keep fermentation temperatures in the normal ale range even though my house is in the mid 70s °F (~24 °C). And finally, I plan to brew a number of batches of beer soon and only have fridge space for so much beer. Brewing the beer was simple. I heated the 2.0 gallons (7.8 L) of strike water in an 8-qt. (~8-L) kitchen pot and mashed the grains in my brewpot. This allowed me to heat the mash slightly every 10 minutes or so and keep it within a couple degrees of my target temperature. (Stir thoroughly as you heat.) It also allowed me to heat the mash to 168 °F (76 °C) for a mash out. When I was done mashing, I took a 1-qt. (1-L) measuring cup and scooped the grains into the beverage cooler, which I had lined with a large steeping bag. [The 3.0-gallon (11-L) cooler will hold 6.0 pounds (2.7 kg) of grain, and my grain bill was 5 lb. 13 oz. (2.6 kg).] I made no modifications to the cooler other than lining it with a steeping bag. After letting the grains settle for about 5 minutes, I recirculated the wort by drawing off a couple cups and pouring it on top of the grain bed. I repeated this six times and called that good enough. To collect the wort, I would draw off a quart from the cooler and pour it into my brewpot. I would then gently pour a quart of hot (170 °F/77 °C) water on top of the grain bed and wait for 2–3 minutes before drawing off the next quart (liter) of wort. (I heated the sparge water in an 8-qt. (~8-L) pot.) When the 2 gallons (~8 L) of sparge water was exhausted, I just drained the remaining wort from the lauter tun (cooler) into the brewpot, yielding just short of 4 gallons (15 L). If you press the spigot and no wort comes out, gently lift the bag off the bottom of the cooler, and perhaps rotate it slightly, then let it back down. From there, I simply boiled the wort and proceeded as normal. In order to keep the boil vigorous enough, I needed to keep the lid partially on, but other than that, everything went perfectly. After chilling the wort, I racked it to a 6.5-gallon (25-L) carboy for fermentation. This morning, there was a small amount of activity in the airlock and it has been slowly increasing over time. It’s going to be a long, hot summer. When fall comes, I know I’ll be making some 10-gallon (38-L) batches of beer out on my porch with my full-sized homebrewing rig. Until then, I have a feeling I’ll be making a few 3-gallon (11-L) batches in air-conditioned comfort. The 3-gallon (11-L) cooler (lauter tun) can hold up to 6.0 lbs. (2.7 kg) of grain. This allows you to brew all-grain batches up to 13 °Plato (OG 1.052), assuming 70% extract efficiency. And you can use malt extract for higher gravity, partial mash brews. To convert any 5-gallon (19-L) all-grain, recipe to a 3-gallon (11-L) recipe, multiply the amount of each ingredient by 3/5. I have been looking into brewing 3gallon batches. What options are there for fermenters? I get a lot of flack for my indoor, small batch brewing but have continued to do it for years. I’m a homebrewer because I like to brew beer. Smaller batches allow for more frequent brewing sessions and chances to experiment. Keep up the great work guys! @Dave, I mash in a 5 gallon cooler I picked up from the big blue hardware store. My fermenters are 2, 3, and 4 gallon (food grade) buckets I picked up from local grocery stores. If you ask the bakery, they will normally give them away for free. I’ve actually come across a few 3 gallon carboys that I’ll use for a 3 gallon batch. Jazzed to see smaller batch sizes get some attention. Not everyone wants 5G of the same recipe. Another thing…can’t beat climate controlled brewing all year ’round. Or…put a low aspect ration Mr. Beer fermentor in a 48 QT ice chest along with two…22-oz frozen water bottles. Swap out both bottles once a day during hi-K…then one bottle a day. Mr B’s little brown keg is large enough for a 2.45G batch size. Cover the kettle with 13″ splatter screen and place the lid on top. Tip the lid over a bowl occasionally when the condensate accumulates so it doesn’t drip into the boil. @Herb I love the ice chest idea. I just did a 2 gallon batch in my Mr. Beer fermentor and was wondering how I could do this in the summer. I’m already on my second 2G batch and have plans for a third next week. MrB’s LBK is large enough to ferment 9L (2.45G). Some hi-gravity worts have a tendency to foam-over, so leave the lid loose until Hi-K is over. I brew 3 gallon batches using a similar method. I use a 5-gallon cooler from the big orange hardware store. I also brew no-sparge, which essentially makes this BIAB, just using a separate mash tun instead of mashing in my kettle. I replaced the spigot with a ball valve, but that is by no means necessary. There’s no need to use different fermenters for primary if you already have some. I generally use my 6.5 gallon bucket or 6 gallon carboy. I do have some smaller food-grade buckets that I use as well. Beers that need an extended secondary (sours, Brett-aged beers, etc) go in a 3-gallon Better Bottle. I generally net a case of beer (give or take 2-3 bottles) per batch using this method. This is perfect for me since I generally only have one beer a day. It lets me brew more often and try more new recipes. As Chris mentions in the article, no starter is generally needed for average-gravity beers. If I’m brewing something bigger like a Quad or Barleywine I’ll brew a lower gravity beer first then use the yeast cake for the high-gravity brew. @eric I would love to know your process in detail. I have exactly your set up and have only done 1 small all grain batch which seemed complicated. I also live the idea of smaller batches and being able to brew more. Thanks! I currently brew mostly ten gallon batches, but find it hard to justify the time for bottling. With kids, spending three or four hours bottling takes too big a chunk out of my weekends. With smaller batches, maybe I’d be able to justify brewing more frequently.